Tuesday lunchtime: I’m sat in the Arcola bar, chatting to Danny Braverman and Nick Philippou about the brilliant sounding Wot? No Fish!! They are talking about making a story of a Jewish family speak beyond its immediate community, about the importance of outsider narratives in a political environment that stokes fear around immigration, about bringing an audience together in their difference. Wednesday night: I’m perched on the edge of my seat in the Pit theatre at the Barbican, shoulders uncertainly shuddering with laughter. The cause of these tentative giggles is Young Jean Lee’s brilliantly unsettling The Shipment, which needles me with constant questioning of my own assumptions. How much is my view of the world tinted by race? Is this bit actually funny, or am I just helplessly falling into a trap? And actually – wait a minute – why am I making the experience of watching this show about me? Friday evening: Partway through a panel discussion on arts criticism at the ICA, a woman in the audience raises the vital issue of diversity. How can critics – a deplorably white, middle-class breed – respond to work from cultures completely removed from their own? Just as I’m mentally firing that question at myself, Matt Trueman responds brilliantly and honestly with an admission of his own discomfort and uncertainty when having to review such shows (I’m really not doing his answer much justice – it was spot on). Saturday morning: Playing catch-up, I read Andrew Haydon’s post about diversity (or lack thereof) in theatre. I’m particularly struck by two points. One: “A Soap For Every Race *cannot* be the goal for a diverse UK theatre”. Two: “We need to stop thinking that a ‘black actor’ *means* something *about* ‘Otherness’; if critics could stop reading a woman being cast as a man as some sort of comment on the ‘male’ character’s masculinity/effeminacy… That sort of thing”. Saturday afternoon: I’m catching up again, seeing Polly Stenham’s new play Hotel at the National Theatre Shed (sorry, temporary theatre). And throughout this play about post-colonialism and Western responsibility, as shock follows shock and I hunch further and further down into my seat, I feel increasingly uncomfortable about its attitudes to race. And then I question my discomfort. And repeat. Two days later and I’m still processing that discomfort. Race is (rightly) a knotty topic at the best of times, and with the conversations and reflections of the last week replaying in my mind I’m finding it increasingly tricky to untangle. Each time I do pick at the knots, my uneasy awareness of my own privilege halts me. So perhaps privilege itself is a good place to start. I think it would be fair to say that Polly Stenham’s work to date has, among other things, concerned itself with a particularly privileged corner of British society. Her first three plays dissected white, upper-middle-class dysfunction, focusing on complex and often broken relationships between parents and children. First world problems of the highest order. And Hotel opens in similar territory. A wealthy white family are holidaying on an unspecified desert island, where the fault lines of their relationships are soon exposed. Vivienne has just resigned from cabinet, made a laughing stock by her husband’s online indiscretions, while their teenage children Ralph and Frankie are messily entangled in the sordid affair (very messily, as it gradually transpires). The air is thick with betrayal and prickly with recriminations. And then – bang. The play that Hotel gave every indication of becoming is suddenly blasted to pieces. On one level, Stenham and director Maria Aberg have done a very clever thing. The opening scenes of the play are one long teaser, playing on the expectations that Stenham’s previous work sets up, allowing the production to sharply pull the rug out from beneath our feet. What looked like a litany of middle-class moaning (played with claustrophobic precision by Hermione Gulliford, Tom Beard, Tom Rhys Harries and Shannon Tarbet) quickly turns into a tense hostage situation, as chambermaid Nala and her locally hired accomplice hold the family at gunpoint. But this would-be kidnapper is not after money. Instead, her aim is to force an acceptance of responsibility from Vivienne, who was behind a deal that offered aid to Kenya in exchange for opening up unregulated trade. Free market capitalism under the guise of charity. The point is a fierce and vital one. Exploitation does not just come in the form of colonial invasion, while globalisation closes the gap between action and consequence at the same time as it distances deed and responsibility. There is even a neat metaphorical resonance with the early domestic drama, as virtual transgression mirrors the way in which we in the West deny our complicity in the structures that oppress elsewhere. 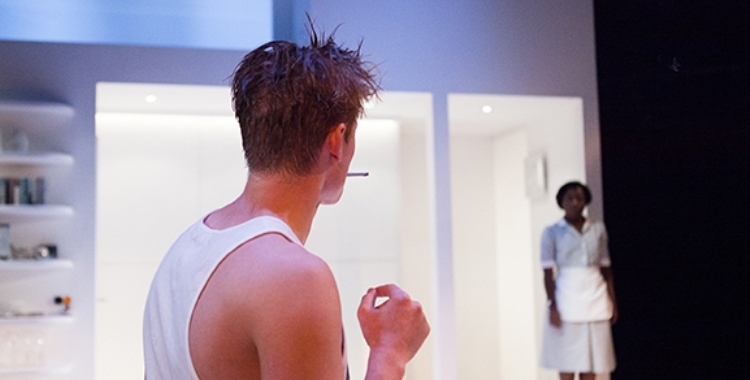 Just as Aberg’s production rips through the fabric of Naomi Dawson’s sterile white set – all pristine, synthetic luxury – the blind complacency of audience and characters is torn down the middle. There are, however, some undeniable problems with this rapid shift. Because it comes out of nowhere, the motives for this sudden violence need a hefty bit of exposition, leaving Susan Wokoma’s Nala awkwardly delivering a lecture with gun in hand. Her accusations seek to leave our complicity in no doubt, but Wokoma’s brief, jarring recognition of the audience feels misjudged – a gesture, rather than a real effort of implication. Then the second narrative lurch is even more preposterous, injecting another shot of violence for little more than the shock it jolts through the audience. Sure, it’s gripping, but I can’t help wondering if this undermines rather than strengthens its point. A thriller is just that: thrilling. Which feels more than a little problematic given Stenham’s subject matter. And so to those knots. Matt Trueman’s review grapples articulately with the possible racism in the piece, although I wouldn’t go as far in my reservations. My main concern lies in the limited representation of the play’s black characters. Nala plays a central role, but her accomplice is a crudely sketched outline, while the other black characters appear only fleetingly, their sole function being to deliver a further blast of violence. The focus remains firmly on the white, Western family, who squirm under the play’s microscope. Perhaps it’s unsurprising that a play skewering white privilege should concentrate its attention on white characters. Further, it could be reasoned that Stenham is deliberately putting herself in this picture, attacking a position that she feels able to speak from (and, of course, a position that many of her audiences at the National Theatre will share). It would also be difficult to argue that she has no right to deal with these issues, reducing the debate to the level of a question asked at this year’s National Student Drama Festival by a young audience member who was outraged that none of the performers in a show about homophobia in American high schools had ever themselves been on the receiving end of homophobia in an American high school. Still, there’s something about Hotel that niggles at me. I think again of The Shipment, a play about African-American identity written by a Korean-American. It sounds potentially misguided, but as I noted in my review, Lee’s own struggle with the show’s ideas (developed, significantly, with the all-black cast) somehow allows an audience to acknowledge society’s inbuilt racial prejudices and our own implication in those. To echo Braverman and Philippou, it brings audiences together in their difference – without ignoring or obliterating that difference. Hotel, on the other hand, is in danger of simply reiterating difference, while its use of its subject matter could be seen as the same kind of stealthy colonialism it attacks. I should stress that I remain uncertain, and I’ve contorted myself through various spasms of discomfort and anxiety in trying to tackle my uncertainty. But maybe that’s no bad thing. Towards the end of the stand-up routine in The Shipment, the black comedian turns his attention to those white people who constantly tiptoe on eggshells, cautious of offending and quick to apologise. But rather than attacking this attitude, as we are braced for, he approves of it. Because what’s wrong with being careful?